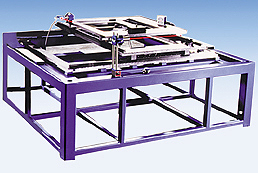 XY open frame part inspection station. Square rail linear bearings and precision ground ball screws are mounted to a steel support structure. The steel support structure is stress relieved to help maintain system accuracies & repeatabilities. Travel is 6 feet (2 meters) by 6 feet (2 meters).